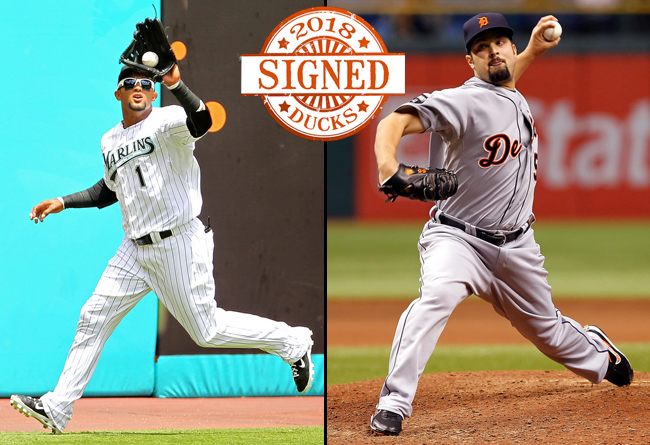 (Central Islip, N.Y., May 8, 2018) – The Long Island Ducks today announced the signings of outfielder Emilio Bonifacio and left-handed pitcher Daniel Schlereth. Both players enter their first season with the Ducks. The 33-year-old was named the National League Player of the Month in July of 2011 after totaling a .380 batting average and a .466 on-base percentage while earning at least one hit in 30 of 31 games. He was also chosen to participate in the Futures Game during the 2008 MLB All-Star festivities at Yankee Stadium. In his minor league career, the switch-hitter was named an MiLB.com Organization All-Star with the Braves in 2016 and a High Class A All-Star by Baseball America in 2006. He was also selected as a Mid-Season All-Star three times and a Post-Season All-Star twice. Bonifacio was originally signed by the Diamondbacks as an undrafted free agent in 2001. Schlereth comes to Long Island with four seasons of Major League experience, including one year with the Arizona Diamondbacks (2009) and three with the Detroit Tigers (2010-12). In 94 appearances, he compiled a 5-6 record with a 4.35 ERA, one save and 91 strikeouts over 93 innings of work. The Alaska native also made three postseason appearances with the Tigers in 2011 as Detroit reached the American League Championship Series. He made his Major League debut on May 29, 2009, pitching a perfect inning of relief against the Atlanta Braves. The 31-year-old spent the 2017 season in the Miami Marlins organization, pitching at three different levels. He combined to post a 2.38 ERA in 37 games with five saves and 39 strikeouts over 41 and two-thirds innings of work. Entering 2018, the Colorado resident has accrued a 2.75 ERA, nine saves, 243 strikeouts and 219 and one-third innings pitched over 194 appearances in the minor leagues. Schlereth, who was drafted by the Diamondbacks in the first round (26th overall pick) of the 2008 amateur draft, is the son of 12-year National Football League veteran offensive lineman Mark Schlereth. In corresponding moves, the Ducks traded right-handed pitcher Jason Creasy to the Southern Maryland Blue Crabs in exchange for future considerations, while outfielder Tyler Holt has announced his retirement and been placed on the club’s reserve/retired list.